The atomic age began on August 6, 1945 in real time – after its July 16 pre-dawn open-air birth in successful Alamogordo, NM testing. 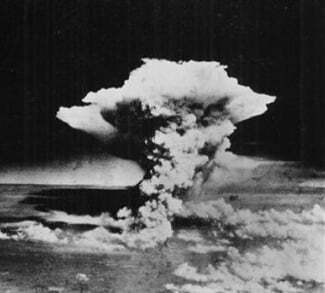 August 6 marks the 70th anniversary of one of history’s great crimes, followed three days later by incinerating Nagasaki. At least 200,000 died, many others scarred for life, future generations to this day harmed by radiologically caused birth defects and other serious health problems. It was to spare the Japanese people from (further) utter destruction…If they do not now accept our terms they may expect a rain of ruin from the air, the likes of which has never been seen on this earth. Nuclear bombing both cities were two of numerous American genocides – beginning with a conquering the new world from sea to shining sea, ravaging and destroying one country after another ever since, endless wars of aggression continuing today. Japan was defeated ready to surrender when Truman authorized testing America’s new toy in real time – twice, not once. Not to win a war already won. To show Soviet Russia America’s new might, what its leadership already knew, what might follow against its cities if Washington decided to attack its wartime ally. US leaders always considered human lives expendable. Many thousands of Japanese victims were considered a small price to pay. The attack or bombardment, by whatever means, of towns, villages, dwellings, or building which are undefended is prohibited. Post-WW II Geneva IV protects civilians in time of war – prohibiting violence of any type against them, requiring sick and wounded be treated humanely. In his book, “The Good War: An Oral History of World War II,” the late Studs Terkel explained its good and bad sides through people experiencing it. The good was America “was the only country among the combatants that was neither invaded nor bombed. Ours were the only cities not blasted to rubble,” said Terkel. The bad was it “warped our view of how we look at things today (seeing them) in terms of war” and the notion that they’re good or why else fight them. This “twisted memory….encourages (people) to be willing, almost eager, to use military force” to solve problems, never mind how they exacerbate them. Wars are never just or good. In the nuclear age they’re “lunatic” acts – horrific by any standard. On February 24, 1945, Japan wanted surrender, asking only to retain its emperor. Roosevelt wanted war continued. So did Truman after his April 1945 death. It’s been falsely portrayed as an expeditious way to end war and save lives – a myth believed to this day by most Americans, ignoring appalling gratuitous mass murder by any standard. And yet it is absolutely essential for our political leaders to defend the bombing because if Americans can be induced to accept that, then they can accept any war, any means, so long as the war-makers can supply a reason. Endless US wars of aggression from summer 1945 to this day killed countless millions from conflict, subsequent violence and chaos, starvation, untreated wounds and diseases, as well as overall deprivation. “There is endless room for more wars, with endless supplies of reasons” justifying the unjustifiable, said Zinn. “It is his Majesty’s heart’s desire to see the swift termination of the war.” Washington intercepted the message. Japanese codes were broken before war began. At least from summer 1940, US intelligence began reading Japan’s diplomatic messages. Earlier in 1945, Japan sent peace feelers. Two days before the February Yalta conference, General Douglas MacArthur sent Roosevelt a 40-page summary of its terms. They were nearly unconditional. The Japanese would accept an occupation, cease hostilities, surrender its arms, remove all troops from occupied territories, submit to criminal war trials, let its industries be regulated, asking only that their Emperor be retained. Roosevelt categorically refused. So did Truman. They wanted war continued followed by unconditional surrender. The bombs of August are an ominous reminder that what happened to Japan can repeat whenever lunatics in Washington believe its to their advantage. Humanity may not survive their madness.